11/02/2018 - All solutions are affected by the enhancement introduced with the latest update of the SCORM™ editor and the e-Learning platform DynDevice. We have just released version 2.3 build 001 of DynDevice on the whole Mega Italia Media cloud. 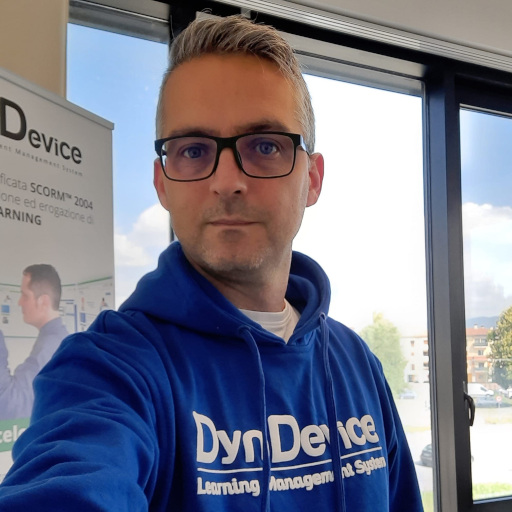 DynDevice is the complete training management system equipped with 6 solutions: e-Learning platform, SCORM™ editor (LCMS with authoring tools), HR management, web content management and company intranet management. New "transfer enrolments" feature (to merge multiple learners). We have added a new "Transfer user data" tab to the "Enrolment Management" window. This feature enables you to transfer enrolments to e-Learning courses and all related usage data (use of learning objects, training contracts, certificates, advanced tests etc.) from one user to another. The form used to carry out this operation is made of two drop-down menus labeled "From" (to select the user whose data you wish to transfer) and "To" (to select the recipient), plus a table showing a preview of the data being transfered (according to the users selected). The documents (certificates, reports, etc.) obviously won't be changed - since the aim of this feature is essentially to merge erroneously-duplicated users, only the username/ID to which documents are assigned will be modified. If the two users involved in the transfer share some of their enrolments, these will not be transfered and will remain associated to the initial user selected in the "From" field. Integration with the " Forum" module. Integration with the "Forum" module of solution 5. e-Commerce and website has been enhanced. Discussions can now be linked to courses and/or group of learners as well as filtered by users and courses much more easily. Notification systems have been greatly improved and are now more customisable (in terms of both sending timing/parameters and content). Likewise, the module's default templates can be enhanced with new settings and are now more customisable. Content displayed on this module is now even more customisable thanks to new labels which can be edited from the control panel. New field for users' personal data. Two new fields have been added to associates' and learners' personal data: "Status changes" and "Planned medical visits". The former enables you to show any changes to an employee's availability status ("Unpaid leave", "Maternity" etc. ), while the latter is used to include or exlcude (i.e. not consider) an employee in the section where Medical visits are managed. • When logging in, if no user with the specified username is found, the error message will be shown, while if the username is found on DynDevice, the system will automatically login the related user to the platform. • when "Redirect HTTP -> HTTPS" is set on "No", that redirect is replaced with the "Error of protocol" page in the index.php which redirects to the default language, too.